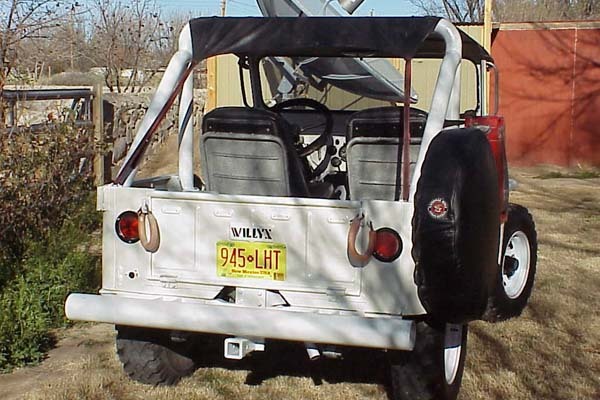 Note: This Jeep was sold by Robert to Todd Marquart of Arizona, in late 2000. Los Alamos National Laboratory occupies 43 square miles of land in Northern New Mexico. Owned by the U.S. Department of Energy, it was born in 1943 as part of the Manhattan Project to create the first atomic weapons during World War II. The Laboratory currently employs some 10,000 people in work ranging from national security, to biological, climatic and space research. This 1956 CJ-3B was originally part of the motor pool at Los Alamos, at a time when the Manhattan Project was history, but the "cold war" was in full swing and there was undoubtedly a huge amount of nuclear weapons research underway at the facility. 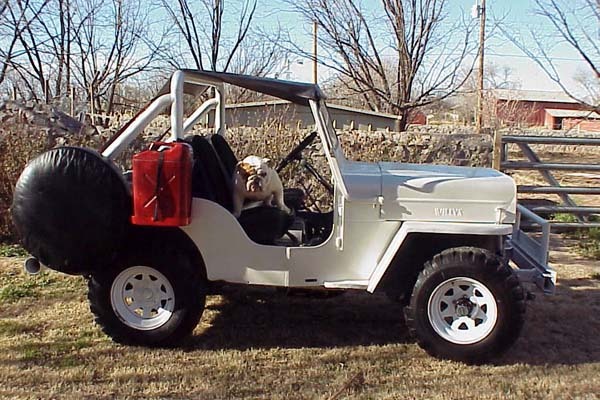 Robert was the third owner since the Jeep was sold by the lab. He says, "I don't know who drilled the holes below the door on the left side, or why. 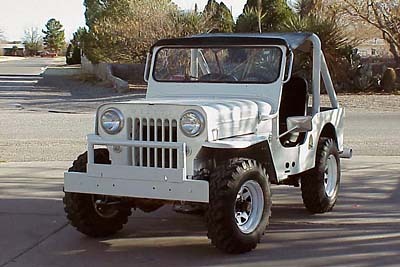 The first civilian owner built the bumpers and grille guard. I understand that he completely rebuilt the engine and transmission, and installed free-wheeling hubs, tow bar, hitch, and windshield. The original ad from when he sold it, states 'over $4500.00 invested in restoration.'" "When I bought it, it was suffering from neglect and lack of preventative maintenance. The oil was a thick sludge and the steering gear box was bone dry, hence requiring a great deal of effort to steer. 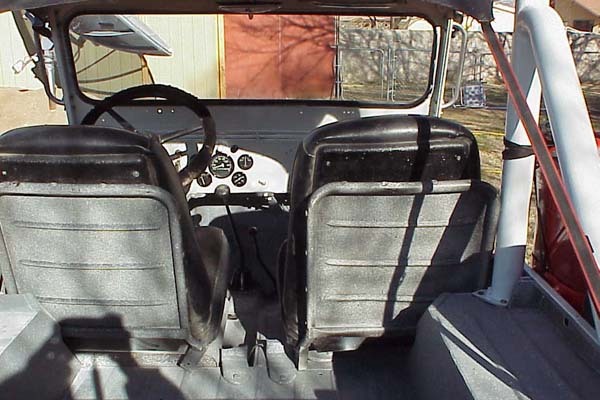 The gas tank had a leak, the tires were bald and flat, the carburetor needed re-building and the seats needed replacing. I have repaired the above myself, and have stripped and sanded it down and painted it pearl white (the original color was red.) 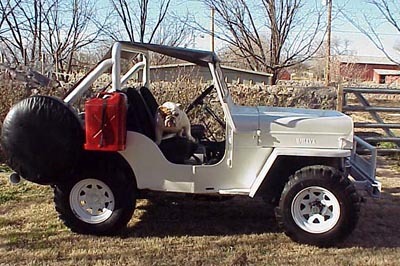 The Jeep is running perfectly now -- it is a joy to operate this vehicle." "It came with a brand new complete canvas top, sides, and doors. But the weather has been so mild the last two winters in this area that I have never put them on. I just use the 'bikini top'. I removed the heater from under the dash when I painted the Jeep. "When I took these pictures I had also not yet replaced the vacuum wiper on the drivers side and the manual wiper on the passenger side." "This Jeep is now my pride and joy -- it's all I drive on my days off, and I use it for everyday errands in town, as well as serious 4-wheeling in the surrounding desert areas going out as far as 50-60 miles. It has never failed me yet. I also tow it out to our hunting areas in the fall and ride around in the mountains of Central New Mexico. "I've had a ball the last two years that I've owned it, riding through the deserts and mountains of New Mexico! I plan to buy a winch since I have gotten it stuck a couple of times. The only other improvements I hope to make are to fix the handbrake, and go to the 11-inch brakes." "The bulldog's name is Ely. I've owned and raised English Bulldogs as a hobby for about 25 years. Right now I have 4 bulldogs, but Ely is the only one that likes to ride in the Jeep."